The initial installation at the Carnegie Museum in Pittsburgh had 23 separate drawings, many of which are now in private collections. A smaller, subsequent installation was exhibited at Mack B Gallery, Sarasota, FL in 2005. I grew up surrounded by music. My first introduction relating music to drawing may have begun when I was about four years old. My brother, then eight, would practice his cello daily, for hours. As he practiced alone or listened to a symphony on a record, playing along with his solo, my fingers would make imaginary lines on the wall separating our rooms. These invisible lines held sounds, my fingers ‘tracing’ what I heard. Many years later I understood this experience to be synesthesia. The bedroom wall of my early childhood became a kind of immense drawing pad. This enveloping experience of being encompassed by sound became translated in my own artwork in a variety of formats including drawing, installation and interactive performance. “Mozart’s Window” is based on the anecdote of the composer looking at the shadows of leaves, transcribing the movements as notes on a stave. 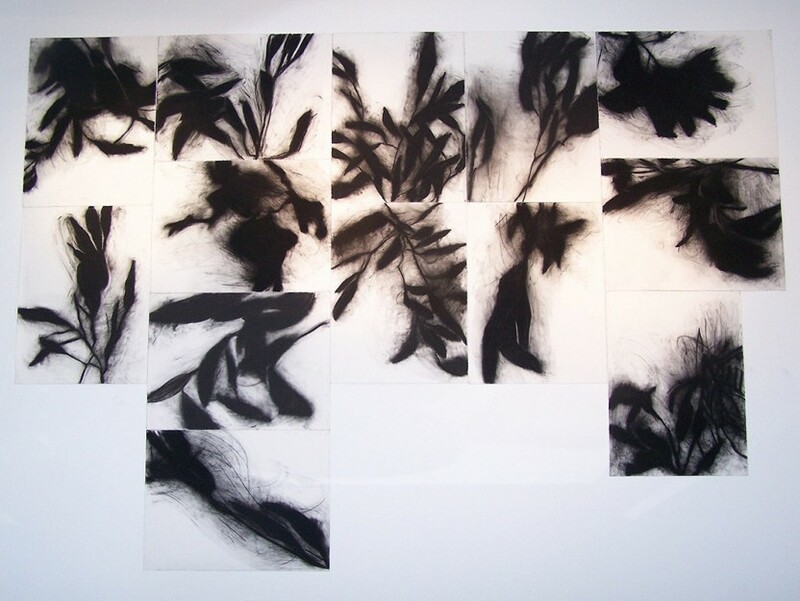 This work is charcoal drawings on separate sheets of 22” x 30” paper, and exhibited on a wall. The orientation of the individual images and the overall configuration is based on the particular site. The initial installation at the Carnegie Museum in Pittsburgh had 23 separate drawings. Many of which are in private collections. A smaller, subsequent installation was exhibited at Mack B Gallery, Sarasota, FL in 2005.